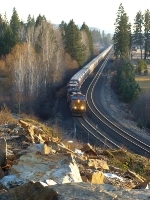 Description: A westbound trailer train in the late evening. Description: Making finw time along the mighty Mississippi - WB freight passes by the Genoa lock and Dam. Description: BNSF ex-ATSF Warbonnets - C44-9W #750 & B40-8W #525 highball a local freight west through Pine Junction on the NS Chicago Line. Description: Eagle Pass - Dubuque, IL. 7716 is dead and getting brought somewhere. Empty grain train, 104 cars. Description: at milepost 114 at the west end of the Emporia Yard looking west. 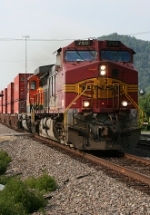 The eastbound stack train has DPU's on the rear both Red and Silver. The DPU's are going to be set out in the yard. Description: The middle unit of three waiting for their grain train to finish unloading. Description: H-BRCNTW blows into La Crosse in the mist of a good ol Wiscosin blizzard!!! Description: H-BRCNTW just a "dashing thru the snow"!!!! Description: An ex CSX GP16 1822 at elevator along the BNSF Red River Valley Sub. Description: BNSF Westbound Doublestack Train passing through Seneca, Mo. Title: More grain, more Warbonnets! Description: Empty eastbound grain train. Get that rotten peach off the point! Description: And a fake bonnet too. Description: The setting sun shines on an eastbound empty grain. This is the same train I originally saw in Spokane in the morning. Title: Q381 with some Fall color too!